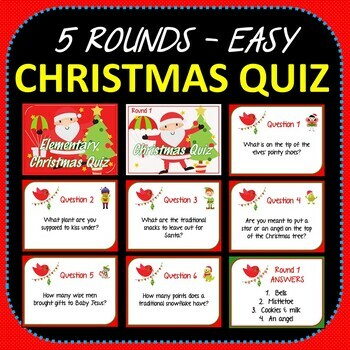 Christmas Quiz Powerpoint with Answers - 5 Rounds - Easy Elementary Level Fun! Christmas BUNDLE - Everything You Need to Play, Celebrate and Decorate! A completely no-prep Christmas Quiz Powerpoint with a range of fun questions about Christmas events, decorations, traditions and characters. Easy difficulty level for Elementary or Low-to Middle Primary students. 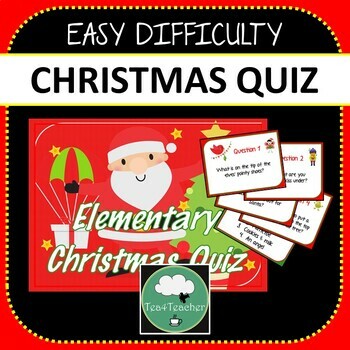 *Please see my slightly harder Christmas Quiz for Middle School/Upper Primary/Lower Secondary students. With 5 rounds of 10 questions, this is perfect as a Christmas-week bellringer activity with one section per day, or as a fun full-class end-of-term quiz on the last day. Divide the kids into teams and get into the festive competitive spirit! A 73-page Powerpoint Document complete with questions and answers for each section. ANY TEXT Full Editable Booklet - For any Novel or Short Text Study - Easy As!